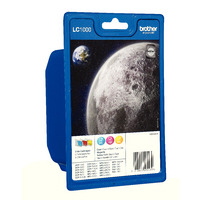 Brother LC-1000 Cyan/Magenta/Yellow Inkjet Cartridge (Pack of 3) LC1000RBWBP Pack of 1 Genuine Brother inkjet cartridges for MFC-240C/440CN/465CN/660CN/680CN/885CW/3360C/5460CN/5860CN, DCP-130C/330C/350C/353C/357C/540CN/560CN/750CW/770CW/845CW, FAX-1355/1360/1460/1560. Colour: Cyan/Magenta/Yellow. Page yield: 400. OEM: LC1000RBWBP. 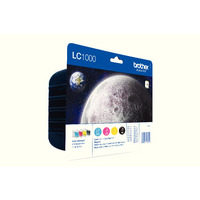 Brother LC-1000 Black /Cyan/Magenta/Yellow Inkjet Cartridge (Pack of 4) LC-1000VALBP Pack of 1 Brother LC1000 value blister pack includes: 1 x LC1000BK Black ink cartridge 1 x LC1000M Magenta ink cartridge 1 x LC1000Y Yellow ink cartridge 1 x LC1000C Cyan ink cartridge. (Approx. 400 A4 pages per colour cartridge and 500 A4 pages for Black). 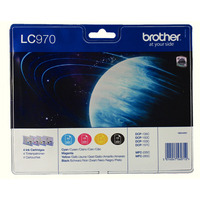 Brother LC-970 Black /Cyan/magenta/Yellow Inkjet Cartridge (Pack of 4) LC970VALBP Pack of 1 Brother LC970 value blister pack includes: 1 x LC970BK Black ink cartridge 1 x LC970M Magenta ink cartridge 1 x LC970Y Yellow ink cartridge 1 x LC970C Cyan ink cartridge. (Approx. 300 A4 pages per colour cartridge and 350 A4 pages for Black). 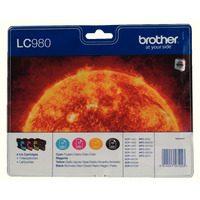 Brother LC-980 Black /Cyan/Magenta/Yellow Inkjet Cartridge (Pack of 4) LC980VALBP Pack of 1 Brother LC980 value blister pack includes: 1 x LC980BK Black ink cartridge 1 x LC980M Magenta ink cartridge 1 x LC980Y Yellow ink cartridge 1 x LC980C Cyan ink cartridge. (Approx. 260 A4 pages/cartridge colour and 300 A4 pages for Black). 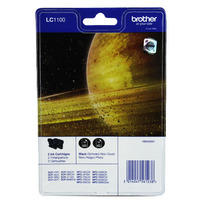 Brother LC-1100 Black Inkjet Cartridge (Pack of 2) LC1100BKBP2 Pack of 1 Black inkjet cartridge twin pack. Original Brother high quality ink. Print capacity of 2 x 450 pages. Twin pack saves money and minimises downtime. Fits MFC-490CW/790CW/990CW/5490CN/5890CN/6490CW/6890CDW. Fits DCP-185C/385C/585CW/6690CW.